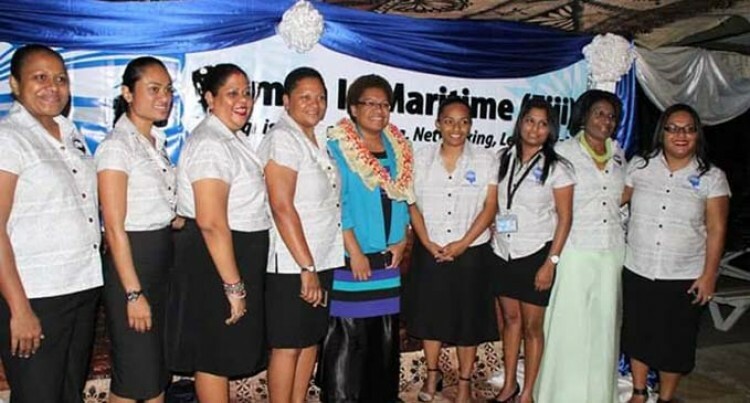 The Women in Maritime Association (Fiji) (WIMA) was officially launched by the Minister for Women, Children and Poverty Alleviation Mereseini Vuniwaqa on the 28th of September at the Suva Royal Yacht Club. She said of the 12 graduates in the trade diploma courses for marine engineering and nautical science at Fiji National University (FNU last year); one of them was a female. She pleaded with maritime stakeholders to highlight this need for increased participation of women in the industry to ensure that gender issues were properly addressed in discussions pertaining to this popular mode of travel. The vision of Fiji WIMA she said was to be the leading network for women empowerment and advancement in Fiji’s maritime sector, including being the primary focal point for engagement at the national level in matters relating to women in maritime affairs. According to Ms Vuniwaqa almost 90% of the world’s trade is carried by ship and that makes shipping one of the most important sectors of any economy. An industry that carries 90% of the world’s goods needs at least 90% of the world’s talent….and gender is irrelevant. However, she said despite the increasing numbers of women in maritime professions, shipping remains a male-dominated industry. “As the industry continues to grow, sustainability for shipping will logically be dependent on more women entering the maritime professions and in order to attract more women to maritime careers and promote equality, the changing of mindsets becomes crucial. It requires our combined commitment to the principles of non-discrimination espoused in our Constitution. Meanwhile the WIMA president Patricia Ho acknowledged the presence of the chief guest. She extended her sincere gratitude to their wonderful sponsors for the evening who generously contributed to make it possible. Ms Ho congratulated the Fiji WIMA Executive Committee members for accepting the challenge to work towards making a difference for women in the maritime industry. Creating a national network for women to discuss realistic, constructive issues with resolutions to benefit all. Improve the level of competency by focusing on education. Be recognized by Pac WIMA with a view of creating mutual support. Establish partnership with international and regional organizations.